Scrambled tofu is probably one of the most mundane vegan recipes there is. Go ahead and roll your eyes when you open a cookbook and see the obligatory entry, I know I do, even at my own. But for a new vegan it’s one of the most important dishes to learn. And for me, even though my inaugural tofu was scrambled 20 years ago, it’s still a staple. It’s one of those things that changes with you, kind of like a culinary mood ring. My scramble used to feel incomplete without mushrooms, but lately I prefer a simpler texture, even onions aren’t a necessity anymore. I went through a broccoli era, and used to take a hardline anti-red pepper stance, but lately the cruciferous is out and nightshades are in. But you don’t have to stop at breakfast, or limit yourself to a plate of scramble and hashbrowns. Look at scrambled tofu with fresh eyes! Here’s a few ways to spruce up your scramble, or use up your leftovers. Serve in a squash bowl: Serve in half a baked squash (acorn or carnival would work perfectly.) Caramelized onions would be nice, too. Breakfast burritos: Wrap up with potatoes, fresh salsa and guacamole. Add to mac and cheese: Use up leftover scramble (or make some scramble just for the occasion!) by adding it to your favorite vegan mac and cheese recipe. Make a sandwich: Not the most ingenious idea, but one of my favorites! A scramble sandwich with avocado, red onion and sprouts. Stuff peppers: Mix with a can of black beans and some salsa. Stuff into red peppers, bake and top with a little vegan cheese at the end. Crepe filling: Serve in a crepe, with a vegan hollandaise sauce. For me, a basic scramble should have nice big pieces in it. It’s crumbled, yes, but not completely in crumbles. Just kind of torn apart and then broken up a bit when cooking in the pan. The flavor should be lip smacking and just a bit salty, but not overly so. Garlic, some cumin, a little thyme – that is the base. From there you can do countless variations using whatever is in your fridge that morning. So this is my basic recipe. When you want a trustworthy and easy to modify standard scramble, this makes a great go-to. First stir the spice blend together in a small cup. Add water and mix. Set aside. Preheat a large, heavy bottomed pan over medium high heat. Saute the garlic in olive oil for about a minute. Break the tofu apart into bite sized pieces and saute for about 10 minutes, using a spatula to stir often. Get under the tofu when you are stirring, scrape the bottom and don’t let it stick to the pan, that is where the good, crispy stuff is. Use a thin metal spatula to get the job done, a wooden or plastic one won’t really cut it. The tofu should get browned on at least one side, but you don’t need to be too precise about it. The water should cook out of it and not collect too much at the bottom of the ban. If that is happening, turn the heat up and let the water evaporate. Add the spice blend and mix to incorporate. Add the nutritional yeast and fresh black pepper. Cook for about 5 more minutes. Serve warm. You can include these additions to your scramble by themselves or in combination with one another. Broccoli – Cut about one cup into small florettes, thinly slice the stems. Add along with the tofu. Onion – Finely chop one small onion. Add along with the garlic, and cook for about 5 minutes, until translucent. Proceed with recipe. Red Peppers – Remove stem and seed, finely chop one red pepper. Add along with the garlic and cook for about 5 minutes. Proceed with recipe. Mushrooms – Thinly slice about a cup of mushrooms. Add along with the tofu. Olives – Chop about 1/3 a cup of sliced olives. Add towards the end of cooking, after mixing in the nutritional yeast. Spinach – Add about 1 cup of chopped spinach towards the end of cooking, after mixing in the nutritional yeast. Cook until completely wilted. Carrots – Grate half of an average sized carrot into the scramble towards the end of cooking. This is a great way to add color to the scramble. Avocado – I almost always have avocado with my scramble. Just peel and slice it and serve on top. I don’t make tofu scramble often enough. It’s so simple that I forget about it, but it’s so good! Thanks for the reminder, I’ll make a scramble this weekend with some roasted root veg. aaahhhh…I LOVE a good scramble! It’s possible that I’m just blind, but I don’t think I see any *tofu* in this recipe. Funny thing, I never made tofu scramble until I moved to Portland. I was never interested it making it until I started seeing it on breakfast menus around town and realized I could just make it at home! I usually don’t add anything other than a lot of garlic and mushrooms. Maybe spinach. You are crazy with your carrots and onions! I featured this recipe with the spinach option on my blog Monday! one of my faves is a spin on the sandwich front: add all the things you usually would have for an egg salad or tuna salad sandwich (veganaise, celery, pickles?) to cold leftover scramble and you get a “chicken or the egg?” salad sandwich. i am psychic! i just ate scrambled tofu and as i was clicking on the blog link thought “i wonder if isa blogged about scrambled tofu” and here it is. neato. Tofu scramble is a must in my house! I have altered though for my sons (6yrs and 2yrs) so that they enjoy it. I cube the tofu for little fingers and forks and use Nutritional Yeast, crushed black pepper, Mrs. Dash and Season All. We eat it for breakfast and dinner: over rice, noodles with veggies etc. I don’t know what we would do with out the basic tofu scramble. Fine, I’ll write a post on cubes vs. mush. You convinced me. I was really hoping you’d dig a little deeper in the philosophic side of this. Tofu scrambles were one of the first and hardest dishes I learned. I came to realize that I like it super simple too. At most, I’ll put some sort or bac’n bits. Though, the puttanesca scramble is an exception to this rule. kimmykokonut- onions and carrots are crazy?! you crazy! :o) i do put carrots and onions (and cremini mushrooms) in anything i saute, which includes tofu scram. Karla, you work at Paradox? There are scrambles there, the number 1 and number 2. Vita has lots of scrambles, too. Are you sure you work there? Are you sure you live in Portland? Do you know that I’ve only made a tofu scramble once? And I think it’s documented on the ppk. I think that means I’m not really vegan. Good timing. I was just thinking about a tofu scramble stuffed into blue taco shells, but a breakfast burrito sounds good too. I’m going to have to find ou what a knish is! Other than that those sound like delicious ways to have fun with tofu scramble. I just made some scramble with scallions, red pepper and shredded carrot, and I substituted 1 T of soy sauce for the water with the spices. I used it as the filling for Chinese steamed buns. Num! Hey Isa, I made a tofu scramble with some soy chorizo, and some peppers and onions, it was amazing! Possibly the best scramble I have had yet. It said on the package to serve with eggs (no thanks!) so I figured why not a tofu scramble instead! those ideas sound great. I’ve never actually made a tofu scramble. Is it possible to do without nutritional yeast, since that’s not an ingredient I generally have around? I love revisiting the classics, especially when there are multiple ways to use it. I never get tired of tofu scrambles. Thanks for the ideas. Inspire by the blog post, I made tofu scramble-potato breakfast burritos for dinner – which I guess means we ate brunch. The absolute best tofu to use for scrambles is found in the bulk section of your co-op. Here in AZ, we get a brand called “Sacramento” which is also the kind we used to buy living in Oakland. Trust me on this, buying fresh extra firm tofu will make you CRAVE all thing tofu. We eat scrambles at least once or twice per week. Great tips. I especially think the “letting the water cook out of it” is key. In our vegan home, that’s when we know brunch is ready! Brilliant! Funny thing is, I can totally remember the days when I perceived tofu scramble as impossible to make without the Fantastic Foods magical spice mix. Manger moins d’animaux, plus de tofu tout ça, tu voudrais bien, mais tu n’es pas de type végétarien/ne. Et encore moins cuistot. C’est là que j’interviens. En effet, quoi de plus concret pour sauver le monde qu’une bonne bouffe ? This is the best post on this topic i have ever read. Best of all, you’ll quickly realize how much easier your life is once you realize that you don’t need to plan a vacation – you let your all inclusive honeymoon simply unfold as the romantic escape and celebration that you always dreamed it would be. i like to sub the black pepper for a healthy pour of paprika and crushed red chilis, and i use silken style tofu cuz i like the more what they call”scrambled soft/undercooked” textures. i like that green curry scramble erin was talking about. is it really made with green curry or is it just the scallions what make it green? either way, sounds good. I always make mine with a cup of salsa at the end and then spread it over a cornbread waffle. It’s delicious! Does this keep in the refrigerator? This looks great. We have a kid with dairy and egg allergies, so we often turn to vegan recipes — which is nice for all of us, anyway. (Sadly, she can’t eat nuts either, which is tricky, but whatever.) Anyway, we’re making this tonight, and it looks awesome. So excited. Thank you! PS We’ll be doing it with black beans, salsa, avocado – agreed, the greatest addition to everything — in a tortilla. Yum. Thanks for the recipe! I’ve tried it and love it. I also love your books! I tried this morning (+onion). Soooo much better than other times I have cooked scrambled tofu, as the nutritional yeast adds a great flavor. thanks! I just made this for lunch. I made some black beans which i layered in a bowl over the scramble, then some fresh salsa i had made and chopped avacados on top! Freakin yummy!!!! Just had it for lunch today! I usually use onions, sweet peppers, garlic, black sea salt, turmeric, nutritional yeast, and whatever else I have in the fridge and/or the garden. Today I added some broccoli, and some tomatoes and kale harvested from right outside. Yum! And I always always always put some sriracha over the top. Oh dear, baby vegan question, ahOh dear, baby vegan question, ahoy! Is the tofu just drained, or drained & pressed? I’m getting mixed signals from recipes but I want to make this soy-based relationship work! I don’t press it for this. A lot of the moisture cooks out so you actually have to add a little moisture back at the end. Ok. I don’t even know how the first sentence got like that. Gross. SorryOk. I don’t even know how the first sentence got like that. Gross. Sorry! Wonderful. Went to two local health food stores and couldn’t find the box seasoning mix to make tofu scramble. I am so glad because this is the best tofu scramble I’ve had. My addition included 1/2 tsp curry powder, thin-sliced half zucchini and diced carrots, celery. Loved it. Thanks Isa! I needed to hear that scrumbled (seeing as you can’t really scramble) tofu will no longer be an hour & a half long event! You have my 67 year old red-meat lovin’, ultra-conservative, Faux News lovin’ Dad hogging the scrumbled tofu whenever I make it. Awww so cutThanks Isa! I needed to hear that scrumbled (seeing as you can’t really scramble) tofu will no longer be an hour & a half long event! You have my 67 year old red-meat lovin’, ultra-conservative, Faux News lovin’ Dad hogging the scrumbled tofu whenever I make it. Awww so cute. Hubby and I are just starting out on our vegan adventure. Made this tonight for dinner with some home-fried potatoes. YUM! Went together really fast and was so good. We added onion, red bell pepper, and mushroom. The seasoning was perfect. Thanks for the great recipe. |pinterest eats| vegan breakfast pizza « corrina, darling! This is the best scrambled recipe that I have tired – it was fantastic this morning. Thanks! Your scrambled tofu recipe was the first vegan recipe I made out of a cookbook, and it was such a pleasant surprise when it turned out to be soooo tasty. I’m still making it 4 years after I first tried it. In spite of trying other recipes, I always come back to yours and most often enjoy it breakfast burrito style with ww tortilla, potato pancake, tabasco sauce and daiya. Yum yum, and thank you! vegan alternatives to these foods? Totally Tubular Tofu Scramble! « Put a spork in it. This was sooo GOOD!!! My son loved it and said it was like eggs but with more favor (he’s 7). Made some potatoes and put it all in a tortilla. Was so yummy! Thank you!! nutritional yeast- YES, you need this!!! Makes it beyond delicious. I didn’t have any in the house either when I started. GO get it! crushed garlic, pepper, turmeric, onion powder. Yummers!! 🙂 Serve with an english muffin- double yummers! I used Fanstastic Foods first, too! Thank-you for this. I have made every vegan recipe I could think of except scarmbles before this – I was afraid of bring myself out of love with brunch. I tried your recipe and loved it! Isa – or anyone else who might be able to help – You recommend a “large heavy-bottomed pan” in a lot of your recipes. What kind do you mean? Like a cast iron skillet? Or something else? My largest pan/skillet is my non-stick, and I feel like that may be why some of my dishes aren’t coming out right. This one (the scramble) doesn’t ever brown, and the mango fried rice went ALL the way to Hades. Suggestions? Wow! This was delicious. I added 1 medium onion, 1.5 c sliced white mushrooms, and about 3/4 cup of mozzarella Daiya cheese. It was fabulous! I loved the herbs. Next time I’m adding diced potatoes and some spinach. Was missing the greens this time around. I used a non-stick pan, my largest one. I found that I had to cook the tofu much longer than 10 minutes as Isa states to drain out the moisture and get the tofu to brown. But it came out perfect in the end! Awesome!!! I just made this and it is the best scramble I’ve ever had. I am headed back down the vegan path after many attempts over the years, this time without trying to dive in head first. A dish like this could convince me stay on this path a little more faithfully. I recall the original recipe using black salt, so I used this instead of regular salt. i added just a few sauteed shredded carrots, tri-color peppers, onions, and a kiss of habanero. DELICIOUS!!! I am so glad I found this on my web search. I was just about to head to the library to find the book as I had been wanting to try this recipe for a very long time. You saved me the trip and the gas. Thanks! I only had firm tofu on hand, but it browns like a dream in my cast iron skillet. The texture is perfect. Definitely wouldn’t achieve that beautiful browning in a nonstick skillet. You mentioned crepe filling as an option. How do you make vegan crepes? And Vegan hollandaise sauce? There are recipe for both in my book Vegan Brunch. I bet if you googled it you’d get the recipes. I have been a vegetarian for 5 years in a family full of carnivores. My husband and I have made the decision to go vegan as a family largely for health reasons after much study, documentaries, and even a visit to a nutritionist. We did go vegan for 2 months a couple of years ago but struggled with it so much as a family that we did not last. After trying several of your recipes that all turned out excellent, I decided to try this one on the family, who – though they are convinced in the head- are still anti-tofu. I am proud to say that it was a hit all around, from the 8 year old who desperately misses eggs, to the 19 year old protein-a-holic who vehemently hates anything tofu, to my chef husband who also has never developed a taste or appreciation for tofu. He actually said it was EXCELLENT!!! Thank you so much for this website and for your cookbooks that I have checked out all of from the library! I plan on working my way through all of your recipes. Try adding a little Kala Namuk salt – it has a sulpherous quality that really brings an eggy taste to recipes! Is there a way to reheat this well? Just made it for dinner but there is waaaay to much here for one guy to eat. Any tips on reheating tofu? My 1st attempt at scrambled tofu and I LOVED this! I was a little shy with the seasonings and spices but Thanks so much! Really enjoyed it! Great, welcome to the vegan world! Being allergic to eggs since my teens, and missing having eating scrambled eggs when I was a kid, this receipt sounded like a great substitute. Made it, tried it and OMG…I am hooked. Yummm…thanks for giving a great alternative to eggs! 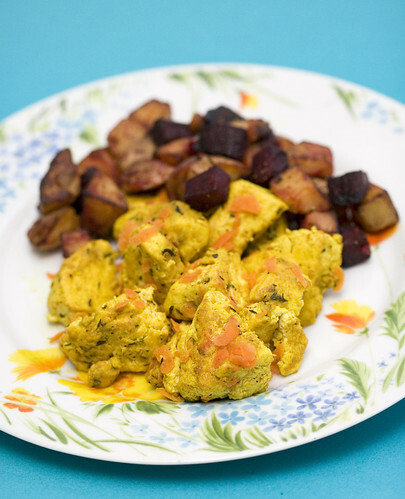 Chili Masala Tofu Scramble | the taste space - steam, bake, boil, shake! Thank God (or whoever) for scrambled tofu. Yes, I am one of those who just found out about it and I’m loving it! Discovering your cook book (the new one) in Bangkok taking it home to Berlin, I try out recipes every day now – and had to look up your website. With scrambled tofu on it. GREAT ! –> All of you guys, what do you think of soy sauce instead of all of Isa’s herbs as a cut off once in a while? THIS is RIDICULOUS. I made this as part of a NOT Huevos Rancheros…and the tofu scramble is SO FREAKING GOOD I am eating it by the spoonful without the other things I made to combine as a dish. It is SO GOOD. It is SOOOOOOOOO GOOOOOOD. I love how the random combination of things can become so different and delicious. WOW. WOW! I made this yesterday for a crepe roll up with mushrooms, potatoes, vegan sausage and a yummy vegan hollandaise sauce. It was SO GOOD! Thanks for the perfect recipe! Coming from a former scrambled-egg-fiend: this recipe knocked my socks off. I ate half the pan myself. Thanks for sharing yet another perfect recipe, Isa! Those are “SOY” GOOD! SInce ive been vegan i have stayed away from Soy for the most part. However, after many years I am starting to eat just a little, and these scrambles were PERFECT in a Hard Shell corn tortilla, greens from the garden, avocado, and homemade salsa.. THANKS for sharing! you can skip the oil and it comes out fine and a lot les calories, healthier too! Just made your tofu scramble revisited, along with your Italian sausage with potatoes and asparagus. Absolutely delicious!!! Thank you for putting these recipes together for us. Sounds like a great breakfast! Perfection!! Thank you! Tonight I made it with chopped spinach and mushrooms, put it in a whole wheat torilla with salsa and black olives :o9. came out a little strong. i would recommend cutting back on the salt and yeast by a third. I made my first scramble from this recipe on Sunday. It’s excellent. ANd I love it cold. It really does evoke something eggy, which I’ve been missing desperately. Thanks for the lifeline! Next I’ll try it with tabasco and fried potatoes to see how it holds up. mix all ingredients except oil and cream in a bowl. heat oil. cook on a medium heat for 12-15 minutes, string completely every 2-3 minutes. Lower heat to low. Add cream. Cook for 1 minute. Serve. I do not use cumin or turmeric as it makes “scramble eggs” taste like curried eggs. I never tried tofu scramble because I thought I tried someone’s at a potluck and it was just bland. BUT, this recipe is awesome (I used black salt to give it a more ‘eggy’ taste)! I’ve eaten more than I should have in the past week. Wow. Thank you! We reference this recipe guideline ALL the time. It is now our definite way of making a tofu scramble. 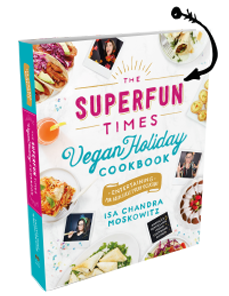 This morning, I made a tofu scramble based off of this with roasted garlic (4-5 cloves) + onion, kale, spinach, bell peppers and mushrooms. It was OUT OF THIS WORLD delicious. Totally amazing. I ADORE this recipe and probably won’t ever bother to make a tofu scramble any other way. Ever. Just made my first tofu scramble. Wow this is awesome can’t wait for my next morning off to have it again! This was the best scramble I’ve ever made. Thank you!! Thank you once again for a fantastic recipe! This is going to be a new staple in my diet. It was my first time making a tofu scramble and I have no idea why I waited so long. Easy, quick, hearty, versatile, overall amazing! This scramble looked at me naked…and called it’s friends.. I don’t know if I’ve commented on this scramble before, but I am absolutely obsessed with it. I make it with onion, tomatos, black beans, red bell pepper, zucchini, and double the spice mix. Every time I make it, I can’t get over how delicious it is. Today I went to my favorite vegan place (Green/Nami in Phoenix) and ordered their scramble. Isa, yours is so much more flavorful and tastey. Thank you for contributing to my culinary well-being! I hadn’t thought of adding avocado to my tofu scrambles before. Sounds delish! Finally I’ve found a tofu scramble I love, thank you! By far the best one ever, this will now be a regular dish at our house. I added carrots and avocado today, so yummy. 15 Delicious Recipes with Turmeric | Everyfoodrecipes, cooking tips, and how-to food videos—all rated and reviewed by millions of home cooks,make the perfect birthday cake, or plan your next holiday dinner. I’ve discovered that because all tofu dishes seem to taste much better if you give them time to meld with the flavors of the spices, tofu scramble tastes better if I mix it up the night before and let it sit in the fridge. I don’t even bother cooking it in a pan– I can simply microwave it to heat it up, and it tastes fantastic. This is super simple to make in advance and keep on hand for quick reheats. I just have to tell everyone how utterly delicious this recipe turned out! I haven’t made a tofu scramble in years, because I do soy only in moderation, so tofu scramble seems too blah, but with some fresh extra firm tofu, some of my favorite fresh veggies, and some leftover soy sauce based marinade on hand in my fridge, and no time to make an elaborate asian dish, I googled and this recipe popped up. I used your basic proportions and technique, omitting the salt because I had soy sauce, and sunflower oil because I had it, and then embellished with your spices plus lemon pepper, chile flakes, a pinch of curry and chopped fresh spinach, turmeric, snow peas, cilantro, grated carrots and avocado. Yum! Kind of an asian, mexican, hippie fusion – I could seriously open a cafe, lol! I Was thrilled to have us enjoying a quick dinner as good as an everything omelette minus the meat, cheese and eggs. 🙂 Thanks! I really love the instructions about when to add in the different vegetables. It is a great list to extrapolate from, too! I had my first tofu scramble for breakfast at a small diner a few weeks ago. This recipe is deelish! I made mine with onions, spinach and red peppers. Served with salsa and sriracha sauce. I’m fairly new to vegan. Was vegetarian for years until I realized how bad milk and eggs really are and decided why haven’t I just gone all the way to vegan? So now I am. Your scrambled tofu looks amazing. What tofu do you use? Mine always crumbles and doesn’t tear! Sarah I don’t know if you live in the US and have access to Trader Joe’s but I use their organic extra firm sprouted tofu, & it works perfectly. I’ve made this recipe a lot since it’s a favorite & the key for me is to just gently break up the tofu into bite sizes as shown in pic. If you stir gently they should stay mostly like that. If not next time you can just make bigger chunks. I don’t think silken tofu, the ones in tetrapaks, would work even if it says firm. Happy cooking. Almost vegan, almost Huevos Rancheros | Vegetarian - and gluten free! How long would you bake the stuffed peppers? If the tofu is extra firm how does it become crumbled? I am a vegetarian and a diabetic. I enjoy these new recipes, but I must have calories counts (for the insulin dose) and nutrition info to make sure I get enough of whatever I need. For some reason, vegan and vegetarian cookbooks and recipes rarely include nutritional info and calorie counts. Just a comment from my point of view. I really appreciate these recipes though! good! Moister than what I normal make- but in a good way. YOU ARE PROVIDING USEFUL INFORNALTION. KEEP IT UP. The convention of the Pilgrims’ first Thanksgiving is saturated with myth and legend. Barely any individuals understand that the Pilgrims did not observe Thanksgiving the following year, or any year from there on, however some of their relatives later made an “Ancestor’s Day” that for the most part happened on December 21 or 22. A few Presidents, including George Washington, made one-time Thanksgiving occasions. In 1827, Mrs. Sarah Josepha Hale started campaigning a few Presidents for the production of Thanksgiving as a national occasion, yet her campaigning was unsuccessful until 1863 when Abraham Lincoln at last made it a national occasion. This is looking so good thanks for providing this wonderful recipe. Good post….thanks for sharing.. very useful for me i will bookmark this for my future needs. Thanks. Christmas is a holiday for offices, organizations, business industries, and schools. Many people go and visit their hometown or friends to celebrate Christmas with the people they love. This often causes traffic on highways and at airports. Public places are crowded during Christmas days and thus the public life almost stops in this holiday season. Many soldiers return to their families for this festival. People decorate their homes, gardens with beautiful lights. There are local competitions of decorations. The best decorator of the house or garden wins. I am lucky that I noticed this site , just the right info that I was searching for! . i’ve been making this scramble with your variations for a few years now. it’s the best basic recipe to start with and then add what you want. thanks! Memorial Day is simply a three days weekend before schools out for the season of summer, where nearly all of the families mainly concentrate on fun, pleasure and little more joy to celebrate this weekend. Scare people or be overwhelmed with the eerie night. It’s also a time to share with those people you love so dear. it was very useful information. THNX FOR THIS. Roman is a professional in the field of software development, cloud, blockchain, and ICO with more than 10 years of experience. Being a passionate technologist, who wants to change the public cloud industry with the use of blockchain technology. Currently, he is CTO and co-founder of UNCHAINET – revolutionary cloud and hosting platform for renting computing resources. The Unchainet team is building an Internet-scale, decentralized cloud computing platform powered by blockchain technology that can be utilized both by individuals and large enterprises as well. UNCHAINET changes the way how computing resources are traded around the world. You have been doing great job by providing this information.thnx for this. Best. This is very useful information shared. Large Christmas Tree Stands Put something really special under your tree this year, Yes we are talking about unique Christmas tree stand that you can put on your best Christmas tree that you got! The best Christmas tree stands are designed to last for many decades, have a stable base that holds plenty of water, are easy to set up and store easily after the holidays are over. This is a nice tofu. Tree Hotel a reputation for itself. Tree building makes a speciality of Indian and Thai cooking. The mealtime menu options a way reduced choice of curries and starters, thus for the simplest expertise you’re suggested to go to within the evening once you are treated to a good choice of curries, tandooris and biryanis. All of the standard favorites build Associate in Nursing look on the menu, aboard a couple of foreign treats and there’s lots to stay meat eaters, fish lovers and vegetarians happy. The decoration is fashionable and complicated with minimalist, however comfy white chairs and crisp white napkins contrastive with the big lighted panels on the walls and therefore the vivacious blocks of coloured glass that kind the backcloth to the bar.